I can sometimes be a little aspirational when I shop. A great example is the supplies I got from King Arthur Flour a while back. I got special high-protein flour and malt powder so I could make bagels. Three years later, I finally got around to it. I really shouldn’t have waited that long. 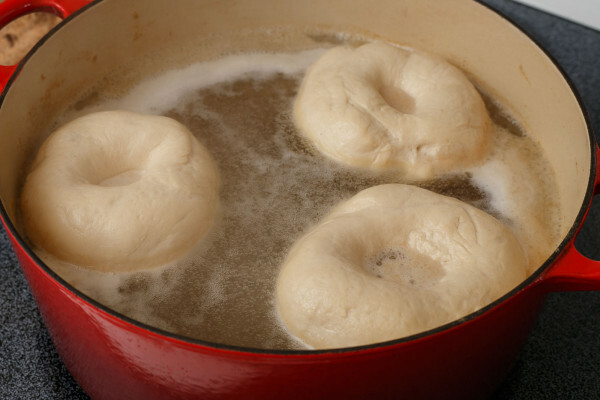 While making bagels does take a bit of work, it is no harder than making bread and might be even more rewarding. 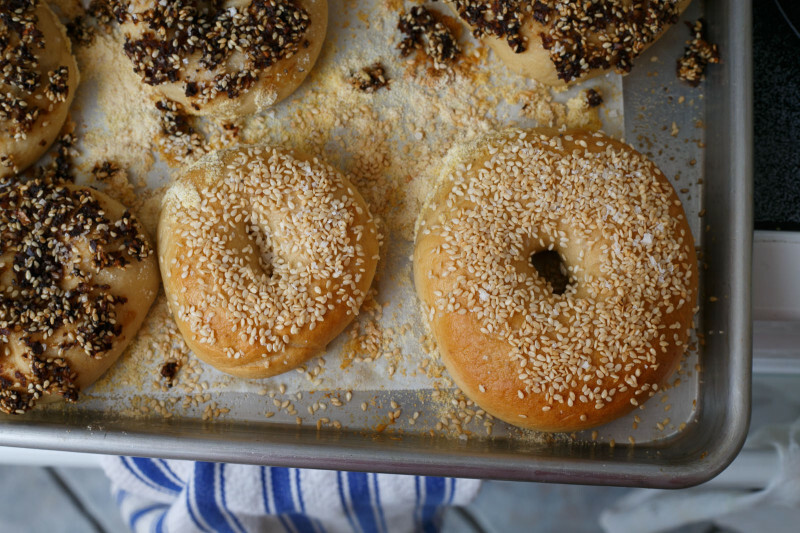 Instead of making a loaf or two, you get a dozen bagels. 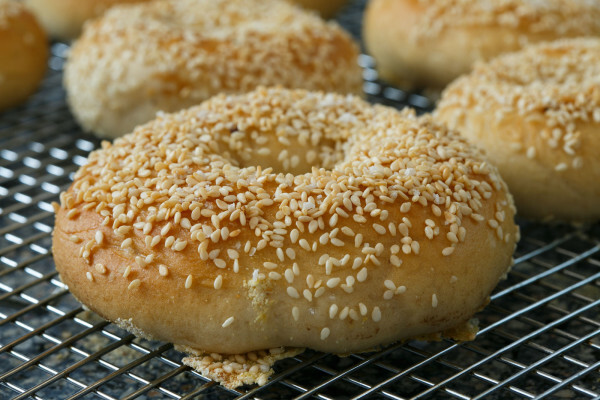 The high protein flour helps give the bagels some extra chew. Of course I am not sure how much of a difference it makes compared to bread flour. The Sir Lancelot flour from King Arthur comes in around 14%, while their bread flour is around 12%. 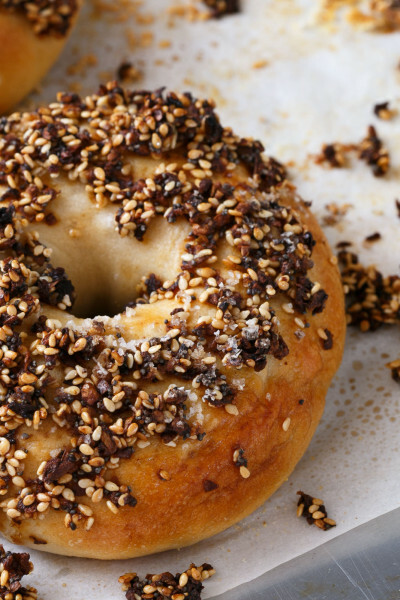 The non-diastic malt powder, helps give the bagels their distinctive taste. Maple syrup or honey alsoÂ supposedlyÂ works great too, but give it a different flavor. Non-diastic means that theÂ enzymesÂ in the malted barley have been deactivated and it just provides flavoring and color. For toppings, I tried making my own Everything topping from dehydrated owns, which I toasted and rehydrated, poppy seeds, minced garlic andÂ sesameÂ seeds, along with some oil and salt. 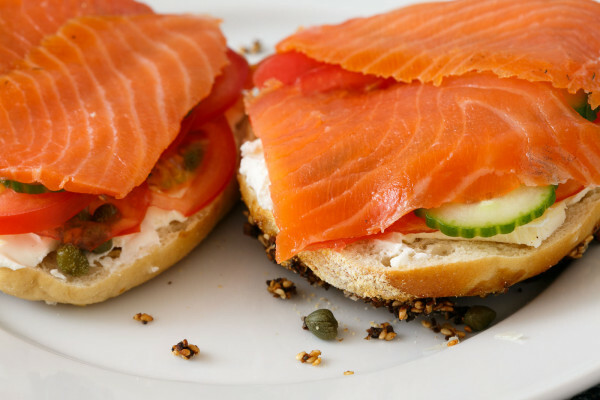 It tasted great, the only problem was that it didn’t stick too well to the bagels. Next time an eggwash might have helped. The sesame seeds had no trouble sticking by themselves though. The dough is very dense. We have the big 6-quart KitchenAid, but it wasn’t too happy with all the mix and started getting pretty warm towards the end. Of course, it isn’t easy to knead by hand. I used the recipe from Peter Reinhart’s Bread Bakers Apprentice book. It looks really complex, but it is actually just pretty simple… it is just exacting.